Here’s one I really should finish. I love this little quilt. It’s a New York Beauty pattern that was in a Fons & Porter issue. 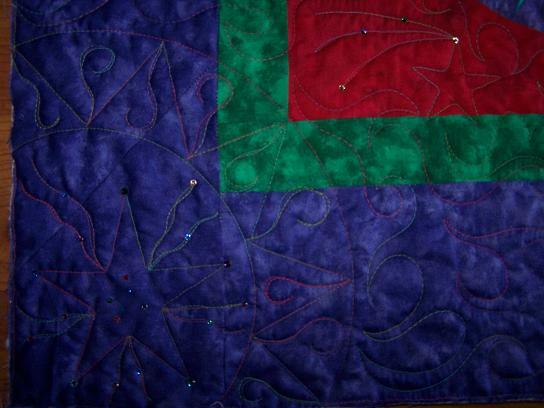 I had so much fun piecing and quilting this one, that I really would like to find time to do another. Especially since I have my A-1 Elite now. 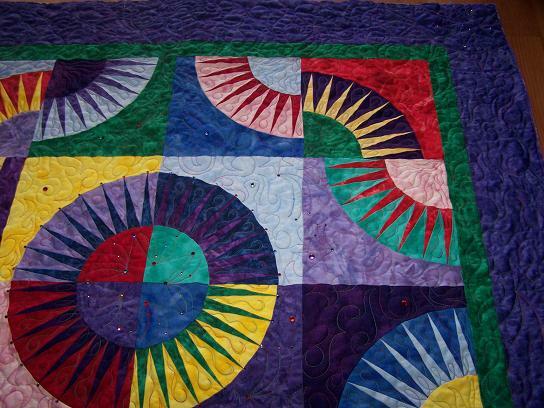 I quilted this one back when I still had my Gammill Premier, with no stitch regulator. I need to add a sleeve for hanging, and bind it. BUT, I keep wavering back and forth on whether or not to add more bling bling to it. What do you think? I really didn’t want to overdo with the crystals, and some days I think it’s fine like it is, and then somedays, like today, I think that it looks unfinished. Since I added crystals to each point in the center medallion, should I add them to each of the points of the rest of the fans? I’d love to hear your opinions. I got off work a little early this afternoon, and am making some piecing progress on my 9P quilts. I won’t get much done this Saturday, as I will be on the golf course following my son around at his tournament. Yep, DH & I will be spending our 11th anniversary together in a golf cart. Sure hope my son plays better this tournament than he has the last two. That would be a great anniversary prezzie, to see him have a good day. One of my readers asked me to say something in my blog about how I photograph my quilts, to get the quilting to show so well. Well, I’m certainly no photography expert, but here’s what I do…I plop them down where I have the best natural light coming in, at the time. Such as the living room floor in front of our glass door & windows. Or on my bed, with the light coming in from the side window. I really need to get a photo stand so I can hang the larger ones. Really, good sidelighting seems to show the quilting the best. I don’t use the flash, except to get a good pic of the colors, sometimes. Another reader asked me to share how I’m losing my weight. I’m faithfully exercising no LESS than three times a week, trying hard to exercise four or five days. I’m either walking on my Treadclimber at home, or in the mornings, I go in to work a bit early, and walk “laps” at the courthouse. My office is on the third floor, so as I do the laps, I go down one stairwell, to the first floor, and up the stairwell at the opposite end of the courthouse, back up to the third floor. I try to do at least 10 of those laps. The stairs do wonders for your lower body 😉 Also, I’m paying more attention to what is going in my mouth, and why. Am I really hungry? Also, how much I’m eating. I pay more attention to fat grams, than anything else. And that’s pretty much it. I went for my massage therapy yesterday, and my chiropractic adjustment. My massage therapist and chiropractor are in the same building, and family. Between the two of them, my shoulder is feeling pretty darn good today. The massage was especially wonderful. I’m going to get back to piecing, so I can have something else to post about! I think you posted this quilt a while back and I loved it then. More crystals? Sure! Go ahead! A little bling never hurt anything! Go for it. Yes. Bling on all the points. And some bling for you, too – for your terrific diet and sticktoitiveness. Hmmm where’s the thesaurus when you need it?? I am thrilled the massage therapy is helping you so much. It sounds like the two treatments go hand in hand and complement each other rather than detracting from each other. And you are the lucky recipient of these procedures! WooHoo! I’ll be the minority so far…..but no more bling. I think it is gorgeous the way it is. The jewel colors and intricate stitching say more than enough. Bling is only gilding the lily. Hi Randi, I think the quilt looks very nice. I wouldn’t add more ‘bling’ unless that is what you want. 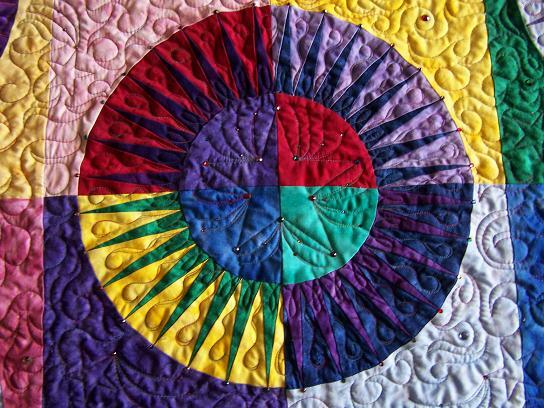 Right now the bling compliments your quilting and piecing, if you add more, the bling may be become more of the focal point than the quilting—and your quilting is always so lovely that it would be a shame to not have it be primary. (Just my 2cents–and I know that I know nothing! LOL). So hard to say… you could send it to my house for closer inspection 😀 Just kidding!! What a great story behind the quilts!! Oh! 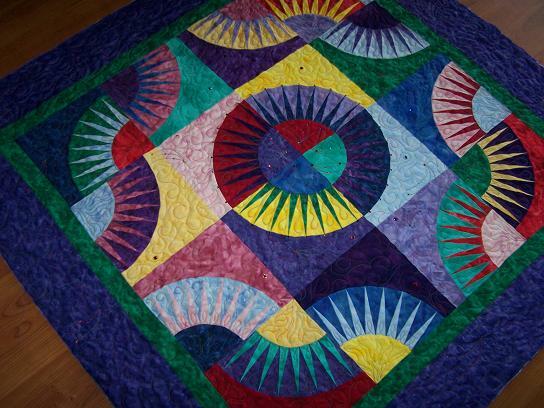 I love the quilting on this quilt…beautiful!!! So talented!